Look what just landed at Manna House today! 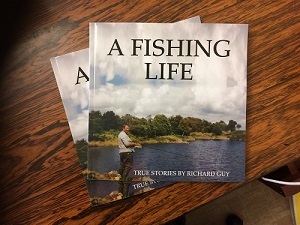 The first print run of Richard’s fascinating book of fisherman’s tales from a life spent fishing in Cumbria and the borders of Scotland – all kinds of fishing in all kinds of places, with differing rates of success, too, but he seems to have loved pretty much all of it. We’ve always enjoyed listening to Richard’s tales at Manna House but now you can enjoy them, too – just visit the Friends of Manna House stall at our Garden Party on Saturday 14 July and Richard will be able to sign a copy just for you. Print costs covered by FOMS and all proceeds to Manna House, naturally. Thank you, Richard!